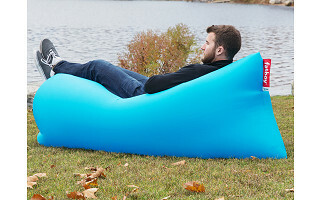 This lounger is made up mostly of air. That’s right. Fill its belly up and kick back on an air couch virtually anywhere. Carry it like a lightweight backpack then transform the durable rip-stop nylon into a full-fledged sofa that can hold up to 440 lbs. Wave your arms to trap the air in its two chambers, then twist the end until its taut and use the clips to secure it. What does lounging on an air couch feel like? It’s pretty great, unsurprisingly! And the best is part is you can set it up in less than 15 seconds whether you're at the beach, while you camp, at home, next to the pool, even with a friend. 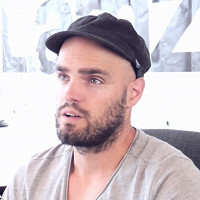 Maker Marijn Oomen called it “Lamzac” which is Dutch for “lazy bum." We get the lazy part of lounging, but it’s also a minimalist solution that helps you to get comfortable wherever you go. Hello! I'm proud to introduce the Lamzac Fatboy lounger to the Grommet. I'd be happy to answer any questions you may have! This is a great idea and I will probably buy one however I would prefer not to be horizontal. Have you ever thought of designing a similar idea where one is able to sit upright like a chair with a supported back? @Anne Hi Anne this is a great idea! We do not have one right now but I will share your thoughts with our design team! How long is it when inflated? I'm wondering if it would be comfortable for someone 6'4". Hello! I am interested in the Lamzac Instant Air Sofa. 1. How comfy for a person who is 6 feet 1 inches tall? 2. How resistant is product to a damp ground? Dirt and moisture. Thank you! I ordered a Lamzac directly from their website almost 6 months ago. I got a shipping email with a UPS tracking number that never worked and no reply from their customer service. I thought this was a great idea for a product but it NEVER came. @Priscilla please e-mail me your order number to [email protected] and I will make sure we get this taken care of for you! Does the Lamzac Instant Air Sofa come with the model in the video?? I hate to be a heartbreaker, Jorge, but it does not come with the model. how much does this weigh, uninflated? My son is interested in this, but what's the weight limit? His weight fluctuates, topping out at 280. Yep, big guy. 6'2". @Guest Your son will love the Lamzac and is well within the weight guidelines! The Lamzac weight capacity is 440 pounds. How long does this stay inflated? Would it last all night if used camping or would you find yourself on the ground in the middle of the night? What a great idea...but will it stand up to kitty claws? I don't mean Robert the Kamping Kitty will use it as a scratching post, but if he climbs up on it to join me? 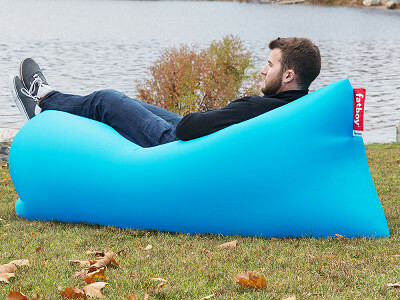 This lounger is made up mostly of air. That’s right. Fill its belly up and kick back on an air couch virtually anywhere. Carry it like a lightweight backpack then transform the durable rip-stop nylon into a full-fledged sofa that can hold up to 440 lbs. Wave your arms to trap the air in its two chambers, then twist the end until its taut and use the clips to secure it. What does lounging on an air couch feel like? It’s pretty great, unsurprisingly! And the best is part is you can set it up in less than 15 seconds whether you're at the beach, while you camp, at home, next to the pool, even with a friend.